Founded in 1904, Bethune–Cookman College is a four-year, private, coed college affiliated with the…. 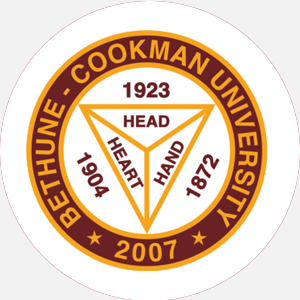 Founded in 1904, Bethune–Cookman College is a four-year, private, coed college affiliated with the United Methodist Church. It is the architectural offspring of the union between Cookman-Collegiate Institute, founded in 1872 by Reverend D.S.S. Darnell, and Daytona Normal and Industrial Institute for Girls, founded in 1904 by Dr. Mary McLeod Bethune. This historic merger took place in 1923. From 1923 to 1932, the school served as a rudimentary training center for students. In 1932, it functioned as a high school and junior college. Bethune–Cookman became a four-year college in 1942, awarding its first Bachelor of Science degree in 1943. Bethune–Cookman’s mission is to serve the educational, cultural, and social needs of its students in the Christian tradition. The current president, Dr. Oswald P. Bronson Sr., states that “excellence in academic study as a religious endeavor is given top priority at Bethune–Cookman.” This excellence results from such emphases as small classes, low student-teacher ratios, research efforts, broad-based curriculum offerings, and dynamic teachers. The home of Dr. McLeod, located on this campus, was declared a national historic landmark by the National Park Service of the U.S. Department of the Interior in 1975. The thousands who tour the foundation are reminded of the spirit of Bethune, the founder and first president of Bethune–Cookman College. Bethune–Cookman College is accredited by the Southern Association of Colleges and Schools to award the Bachelor of Arts and Bachelor of Science degrees. July 30 (fall); November 30 (spring); early admission. High school graduate (or equivalent) with a minimum 2.25 high school average; completion of the following units: 4 English, 3 mathematics, 3 Social Sciences, 3 science, and 6 academic electives; 2 modern languages strongly recommended; two letters of recommendation; a mandatory pre-entrance medical record; a written essay; and an interview with college officials. A nonrefundable application fee is due by July 30. Minimum of 124 credit hours, with 6 hours in a foreign language, 6 hours in mathematics, 6 hours in science, and 1 hour in computer science, and a minimum 2.0 cumulative GPA in a major field of study. Must pass all sections of the College Level Academic Skills Test (CLAST), complete the mandatory orientation-week program for freshmen or new students, complete a senior seminar, write a senior research paper, and pass a senior exit examination. The last semester of the senior year must be completed on campus, and one full year of study must have been obtained at Bethune-Cookman College. Total enrollment (men/women): 1,023/1,535 In-state: 1,815 Other regions: 28 states; 25 international Full-time undergraduates (men/women): 1,014/1,343 Part-time undergraduates (men/women): 86/115 Ethnic/racial makeup: African American, 2,446; Asian, 8; Caucasian, 25; Hispanic, 25; International, 200; Other/Unclassified, 41. Campus Regulations: Students must attend a college orientation program and reside at least one year on campus. Students must also maintain a minimum 2.8 GPA to join a service/social organization. Campus Services: Health center, psychological counseling, late-night transport, remedial instruction, career planning and placement services, and religious services, including chapel. Campus Activities: Social activities include theater, concerts, dances, and chorale. Students may work on the Bethune–Cookman yearbook (the B-Cean) or the school’s student newspaper, the Wildcat. Leadership opportunities can be found in the Student Government Association or numerous other student-run organizations. The Reach Program gives students an opportunity to provide service to the surrounding community. Greek sororities include Alpha Kappa Alpha, Delta Sigma Theta, Sigma Gamma Rho, and Zeta Phi Beta; fraternities include Alpha Phi Alpha, Kappa Alpha Psi, Omega Psi Phi, and Phi Beta Sigma. Honor societies include Alpha Chi, Alpha Kappa Mu, Alpha Mu Gamma, Beta Kappa Chi, Honors in Teacher Education Certification (HITEC teacher/ed), Kappa Delta Pi, Minority Access to Research Careers (March-Science), Phi Beta Lambda Business, and Psi Chi National. Two social/service organizations are also represented on campus. Bachelor of Arts: Broadcasting Production, Business Administration/General, Business Education, English, English Education, French Education, German Education, History, Hospitality Management, Journalism, Marketing, Music, Music Education, Political Science, Philosophy, Psychology, Religion, Spanish Education, Speech Communications, Social Science Education, Sociology Bachelor of Science: Accounting, Biology, Biology Education, Chemistry, Chemistry Education, Computer Information Systems, Criminal Justice, Elementary Education, Engineering (cooperative), Mathematics, Mathematics Education, Medical Technology, Physical Education, Physics, Physics Education, Psychology, Special Education Preprofessional: Occupational Therapy, Physical Therapy, Prechiropractic, Predental, Pre-engineering, Premedicine, Preoptometry, Prepharmacy Teacher Certificate: Biology Education, Business Education, Chemistry Education, English Education, French Education, Music Education, Physical Education, Religious Education, Social Science Education, Spanish Education, Speech Communications Education.